Residents on Cape Cod are bracing for Jose, which is expected to be a Tropical Storm as it approaches the Massachusetts coast on Tuesday evening. Cape Cod and the Islands are in a Tropical Storm Watch with Jose making its approach. As the storm nears, most Cape residents said Monday they're planning like they would for a strong nor'easter. "I'm used to storms like this," said Yarmouth resident Christopher Trapp. "I don't think it's going to be too bad. There certainly is potential that I lose power but beyond that, I don't think it's maybe too terrible." Alyssa Wolejko said she splits her time working in Boston and at home on the Cape. From Nantucket to the coast of Scituate, Massachusetts, residents are preparing for Jose to make its way up the eastern seaboard. "(I) work from home two days a week so I picked the days that were going to be the storm so I didn't have to commute into Boston," Wolejko said. "Because people driving in Boston during bad weather... They're horrible." 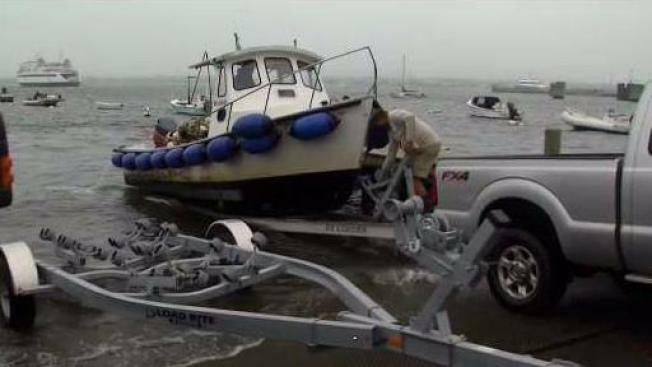 In Plymouth, residents began hauling their boats out of the harbor on Monday in anticipation of the storm. "In the past I’ve left it in until November but with the storms that are coming, the other storms they’re kind of watching, I think it’s best to pull it in now," said boat owner Anthony Dimaggio. "Season’s over, school’s back, that’s it, it’s over." But not everyone was ready to pack it in. 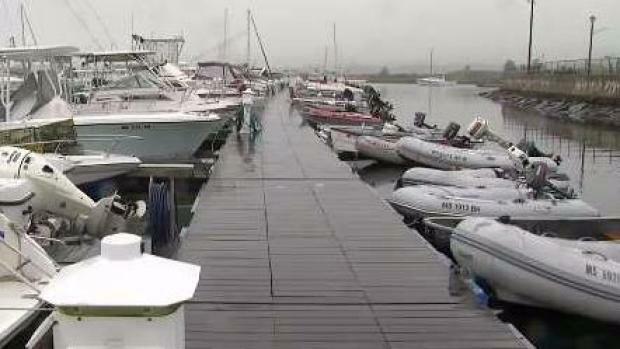 "There’s still so much more boating season left," said a hopeful Erin Perry. "I think it would be premature to take them in now." As countless people removed their boats from the harbor, the Perry family was heading out to secure theirs in the water. "We’re going to tie an extra line up to the bow," said Matthew Perry. "Make sure the pumps are ready to go." Town officials advised boat owners to remove their vessels, and spent the past few days checking on the boats that remain. "We just went out a little while ago," said Plymouth Harbormaster Chad Hunter. "Check the mooring lines, make sure everybody's lines look good." Meanwhile, fisherman were getting in one more day as they may not be able to head out again until Friday, and whale watching trips have been canceled for the next three days. Town officials say they’ll be communicating with residents as the storm hits. "We’ll post information tomorrow, we’ll both tweet it as well as put it on Facebook and our website," said Plymouth Town Manager Melissa Arrighi. "Particularly if we open some kind of warming shelter in the event somebody does have downed lines or loss of electricity." In Marshfield, Dave Russo said he wasn't expecting Jose to do too much damage on the South Shore. Still, he and his neighbors hoisted the stairs off the sea wall, packed away loose property, and tied down patio furniture just in case. "The ocean usually comes over here on storms, and the rivers flow down the side," said Russo. 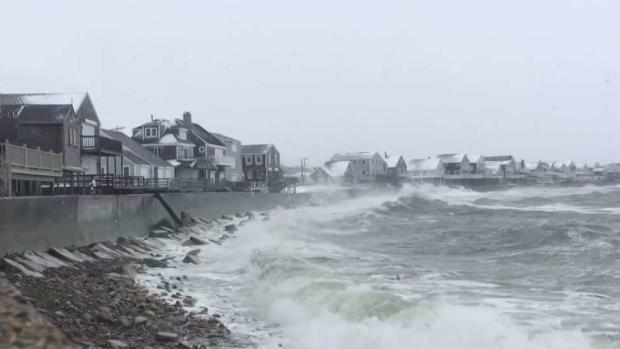 The U.S. Coast Guard said the storm could bring 20-30 foot waves, and winds 34-63 knots as it sweeps by the New England coastline. "If it comes up and goes out, we should be OK if it goes up and then comes back," said Joe McCabe of Scituate. "It’s like a northeaster so then we get whacked." As crews continue to work on capping the seawall in Scituate, boulders were being put in place to protect homes behind where the wall hasn’t been finished. "They’re trying to hold back the weather and Mother Nature, as you know, is pretty furious some times," said Dean Murphy, whose brother is buying waterfront home there. While the storm makes its approach, Hy-Line was warning customers Monday they will likely cancel passenger ferry service starting Tuesday between the Cape and the islands. The Steamship Authority said they also expected to have service disruptions beginning Tuesday — possibly until Friday due to Jose. While summer isn't over in September on the Cape, vacationers like Norm Leighty were still trying to squeeze in trips to Martha's Vineyard and Nantucket. "If the weather's good, we'll be coming back here Wednesday," he said. "We're trying to do everything we can before Tuesday and Wednesday," added Laraine Shwailik of Pennsylvania. Meteorologists say wind gusts could reach 60 miles per hour during the storm.